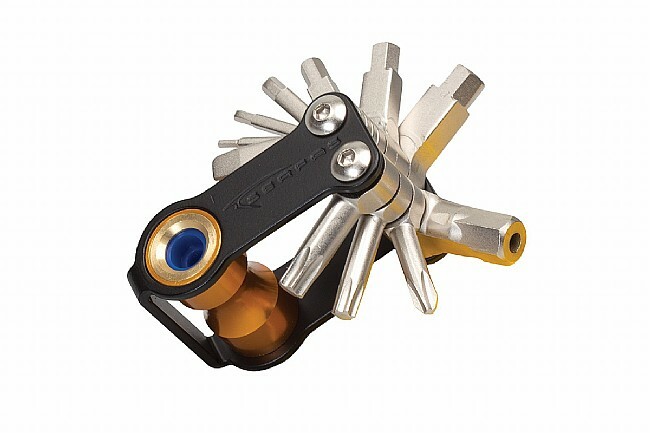 Serfas' ST-13i CO2 Multitool is a clever, convenience-oriented multitool containing the essential Allen Keys, screwdrivers, and Torx bits needed for mid-ride fixes, as well as an integrated CO2 inflator "tool" and a bottle opener. Compatilbe with Presta valves, the integrated CO2 inflater eradicates the need to carry a separate CO2 inflator, reducing clutter, weight, and streamlining your repair/flat fixing process. Tools: 1.5, 2-6, and 8mm Allen Keys; Phillips & Flathead Screwdrivers; T25 & T30 Torx.